All in camera, as always, this is a light painting from a Monday night trip to Hyde Park with Seitrams. The intention was to shoot Winter Wonderland, but we kind of got distracted light painting around the Serpentine and never made it. This one is shot along the south edge of the lake, with a low mist fogging up the front element. It was creating a neat gas lamp feel around the edge of the frame, so I let it be. That’s the strange blur you see in the top left corner – just streetlight on the misted UV filter. 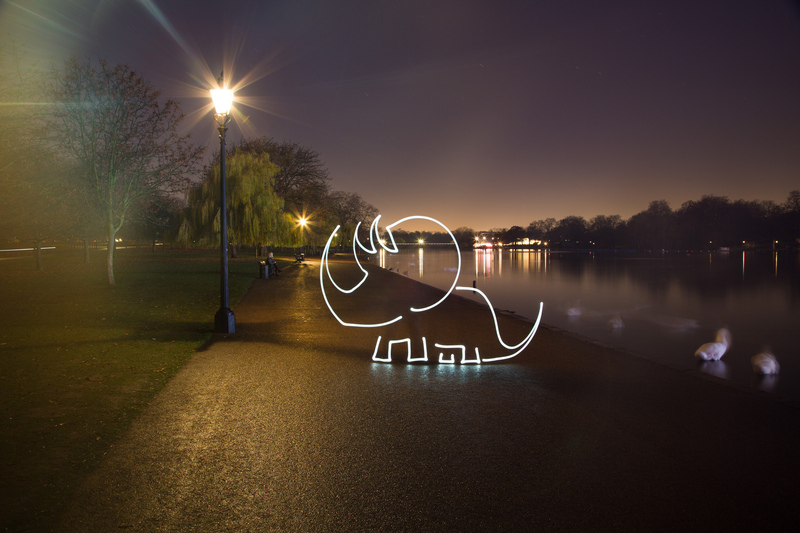 The triceratops (or juvenile torosaurus,if you subscribe to that particular theory) is all hand drawn with a CREE LED, with a sock diffuser. And yes, you can see my legs and anorak behind its forelegs. We were shooting in this location for maybe an hour, yet it was only when processing I saw the girl sitting on the nbench to the dinosaur’s left… Kind of haunting. Hope everyone is having a fantastic week so far!